View more information about this image here. You may order a high quality photographic copy. No known Copyright restrictions - Conditions of use. Over a number of years a dedicated team of staff at the State Library of South Australia have undertaken a project to index photographs, death notices and in memoriam notices of South Australia's First World War soldiers. This has lead to a collection of over 30,000 references to notices published in the South Australian newspaper The Chronicle between 1915 and 1919 under various headings including 'Heroes of the Great War', 'Heroes of the Empire', 'Died on Active Service' and ‘Biographical’. The notices were placed by friends and relatives of service personnel who died, or were wounded, or were decorated during World War I. Some references include portraits. Some newspaper printing errors have been corrected using official sources. To locate a South Australian soldier in this database, type in their surname and an initial in the subject field of the catalogue. To find articles about Australia's World War One soldiers in various digitised newspapers, why not go to the National Library's Trove website. Here is a link to their website under the search title 'Heroes of the Empire'. These resources are only available for use onsite. However, if you are unable to come into the Library you can use our Ask Us service. The Ask Us service enables you to submit questions to our librarians who will attempt to provide you with helpful information. The basic research service is free although there are charges for copying. You can start your search onsite using Digging for diggers: a guide to researching an Australian soldier of the Great War, 1914-1918. This booklet lists the names of the South Australian soldiers who gave their lives for their country in World War I.
Nominal roll of deceased members of the A.I.F. & A.N. & M.E.F. A three volume work published between 1918 - 1920. These volumes feature photographs and biographical details of South Australians as supplied by subscribers. A souvenir album "Our Bit in the Great War" comprising World War I service records, photographs and newspaper cuttings of some South Australian soldiers and nurses. Index available online. This searchable database is provided by the Australian War Memorial. The Commemorative Roll records the names of those Australians who died during or as a result of wars in which Australians served, but who were not serving in the Australian Armed Forces and therefore not eligible for inclusion on the Roll of Honour. The National Archives of Australia and the Archives New Zealand are working together to build a new website, Discovering Anzacs. This website will have a unique profile of every Anzac who enlisted in World War One, linked to their service record. You can help tell the story of Australia and New Zealand during the War by building on profiles and adding your own family stories, photos or details of their service. Incorporating tributes of honour for South Australia and the Northern Territory. Also includes profiles of South Australian service personnel in all conflicts. These files consist of thousands of individual case files of Australian personnel reported as wounded or missing during the First World War. South Australians are included but more complete records for South Australians are in the records of the SA Red Cross Information Bureau held by SLSA (see above). This searchable site lists the 1.7 million men and women of the Commonwealth forces who died during the two World Wars. This site is dedicated to commemorate the lives of those who served in the Great War in pictorial form. 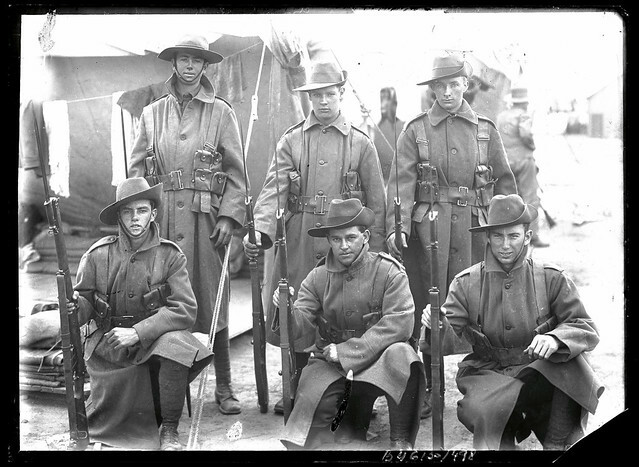 This database draws on a wide range of sources to provide details on the 330,000 men and women who served overseas in the (First) Australian Imperial Force, 1914-1918. The heart of Mapping our Anzacs is a tool to browse 375,971 records of service in the Australian Army during World War I according to the person’s place of birth or enlistment. Overseas Memorial Search is the Office of Australian War Graves (OAWG) register of both Government and privately-constructed memorials for Australian Service men and women. The Australian Women's Register is a rich and growing source of information about Australian women and their organisations.